The Cassandra Voss Center provides a vibrant and collaborative learning environment for the study of women and gender, and enables cooperation of all persons in the creation of more just and inclusive communities. Women need to talk in powerful ways. Research shows mentorship and advocacy are essential for women to advance in business leadership. Businesses know the advantages of connecting with promising leaders and future employees before they even step off the graduation stage. Cultivating a pipeline of talent is mutually beneficial to students and future employers, which is where the Cassandra Voss Center comes in. Karen Stuckey, SNC alumna and Senior Vice President at Walmart, will launch the hour with a short talk on leadership lessons. 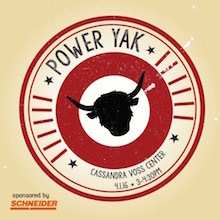 Power Yak: Fun, fast-paced “speed networking,” connecting students and women business leaders. Location: The Cassandra Voss Center at 311 Grant St. in De Pere. Across from the Kress Inn and Bemis International Center on the corner of 3rd and Grant Streets. Parking: Park in lot directly next door to Cassandra Voss Center (across from Kress Inn). Arrival: We recommend you arrive around 2:45 p.m. so you have time to enjoy some wine, cheese and discussion with other participants before the program. Bring: Business cards if you have them.